The ones I got on the Marché Saint-Antoine the other day were this year's last. There will be no more Prunes St. Jean this year. Soft and flavorful, they expand like summer days in our mouths. Ian looks doleful and waits sweetly while I pit them for a pie. We're waiting, hoping, fingers crossed for news on our grant application for the teaching kitchen. I toss Ian a pitted plum every now and then and he repeats each time "merci, maman". Wishing I had filmed him, I hear Loic running the bath. The baby trots back, mouth full of plum, to peel off his play clothes and arrange his boats. I head to the kitchen to dump these plums onto some quick finger-spread dough. Look, there are some currants. A little sugar. Fingers crossed, then licked. *the word for plum in French is prune. Perfect with a dollop of creme fraiche. The little golden ones were the roadside/hilltop wild ones when I was a child, and we made many a scratchy scavenge in and up with buckets and a tiny rake. They were absolute mouthfuls of gold itself, warm and bursting sweet, and after a wash, a trip into a blanching pot, and a crush through the chinois---jars of clear pale juice for measuring out the sugar and Sure-Jell. Another boil to fill the kitchen with that unmistakable redolence of pure Summer, and the small jars twinkled with the most prized of the pantry's treasures---jewelly plum jelly, saved for the most important occasions. I'd go into the Fruit House, take down a jar, and just hold it up to the door, between me and the sun, just to take in that jarful of radiance. I KNOW yours are filled with that exact remembered charm. 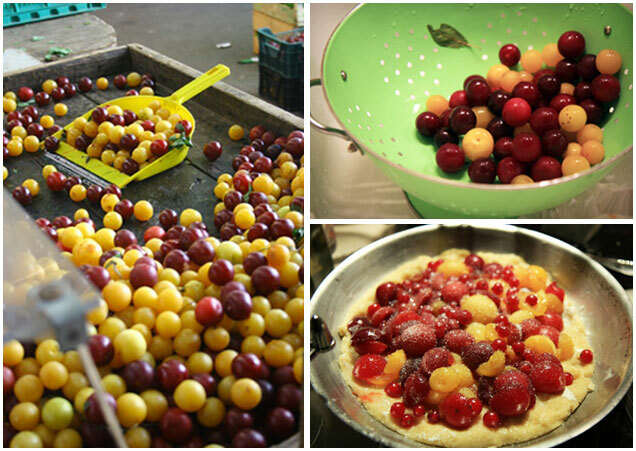 We have three plum trees in our backyard, so we have tons of plums every summer to make pies, ice cream,.... I love mixing different color in my pies, the final taste is so much deeper, so out of this world!!! Plum pie makes me think of my parent's garden in August! Thanks for reminding me of it! I got some red currants today from someone's garden . Not enough for jam .... but plenty to add to a pie . What a good idea . Good luck with your licence application !